M announced, “It is 100 days until my birthday. I’m going to make a ‘keychain’ to measure the days.” Apparently, M remembered making an Advent Chain in December to help with waiting for Christmas. Every day in Advent, she took a link off the chain, and when none were left, the next day was Christmas. Extrapolating from that experience, M set out to make her chain, inviting various collaborators to help construct and count. 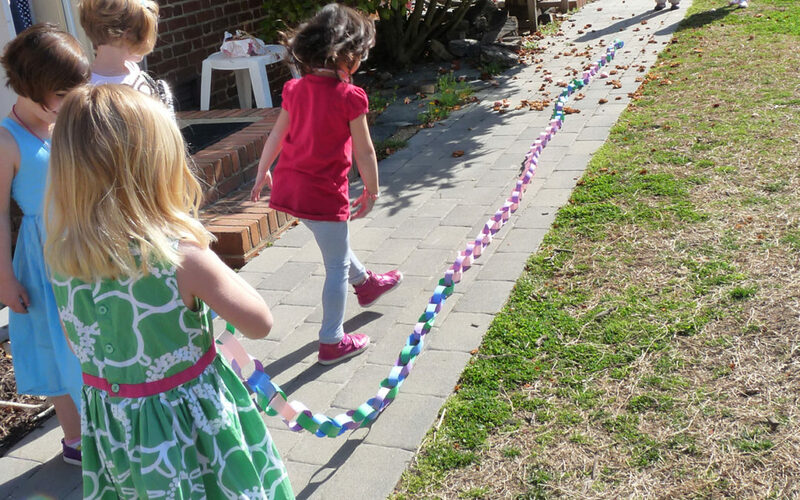 Working for two mornings, the children overshot the goal a bit, to 105 links. “It’s OK to go past my birthday,” M declared. The children delighted in the sheer length of the chain. The “keychain” spans the distance between the two rooms in JK and then some. Until they were invited to spread the chain out on the floor, the girls had been thinking of the chain in terms of its height when vertical. They had reached an impasse, because even holding the chain as high as they could while standing on the top step of our tallest step ladder did not suspend the chain from the ground. Laying it out on the ground to document its length seemed to inspire new hypotheses about the chain’s size. The children took the chain into the Outdoor Classroom to see how far along the sidewalk the chain would stretch. “Let’s try it!” was the children’s enthusiastic response. So six volunteers and I took the chain across the street. The children had to work on carrying the chain together. One of the first things they learned was that if you are holding the front of the chain you have to pay attention to the person holding the back of the chain and stop if she stops. Otherwise, the chain breaks. The chain did break twice during the exploration, but after that the children were much more mindful of both ends of the chain. They stopped frequently to measure, making estimations like, “I think it’s as long as the walkway along the garden.” They tested each hypothesis as it emerged. “12 more what?” I asked. “12 more links,” they said. This is a good example of the children’s fluidity of thinking, going from number of links to number of stepping stones and back again. Though they knew that there were 105 links and could see that there was twice as much distance to cover as they had length of chain, they measured the distance left with a third unit altogether. “How many?” asked Mrs. F.
That sounded like a lot to M.
The week before, the children used a fold-out ruler to measure a space in preparation for creating some scenery for a play they had written. They consistently measured without regard to the starting point of the ruler. So sometimes they measured (by counting or by reading the number on the ruler) with the edge of the space or paper at the 3″ point on the ruler; sometimes at the 9″ point. The inconsistency of appearance and result did not bother them. On this day, however, the children were very much focused on starting points. In fact, after their initial hypothesis (“We think that the chain is as long as the distance between Ms. F’s office and the library”), which proved an underestimation, the children intentionally changed the starting spot over and over, until they finally did find the starting spot that made their prediction correct. H stands at Ms. F’s office door, and M, with the other end of the chain, is nowhere near the library door. The starting point moves farther and farther down the hall. E and H became more and more accurate with their spatial predictions, at least the negative ones: “It will not be long enough,” they’d predict. We asked the children to make their predictions public before they tested them, so that they could travel together mentally as well as physically. They’d make a guess, test the guess, revise the guess, test again, and so on, until they finally reached the library. Then they started again, with the goal to reach L’s sister’s class at the end of the K-1 common area. At one point they encountered Ms. H-D, Lower School computer teacher. They explained what they were doing, and she challenged them with the question, “How many JKers long do you think it is?” She knew that when the children listened to her but ignored her question, the query was not consistent with the collective thought process. All the way down the hall of the Lower School, the children’s measurements were linear. As a challenge, when we got back to the library, I asked the children to predict whether the chain was as long as the red line along the circumference of the round rug in the library. Most likely perceiving the distance of the diameter of the circle, the children were confident that the chain would go around, probably twice. They were surprised when the chain would not even go once around the red line. Hd proposed that they see if it would go around the yellow line, “because it’s smaller.” It did, exactly. On the way past Miss Annie’s office, we stopped in to tell her what we were up to. The children measured her office. But at first, the chain went around a corner and then to the edge of her office. I tried to provoke the children’s thinking about what happens in measurement when a line isn’t straight. But they didn’t want to consider that. Instead, they changed the starting point, outside Miss Annie’s office in the hallway, so the measurement could be linear. “It goes from the pink square in the hallway to the edge of Miss Annie’s room,” explained M.
Hungry and tired, the children still chose to stop and measure along the way back to JK. The girls spent several minutes trying to make sure that H was at the beginning of the walkway and that the chain was straight before declaring that it went “almost” all the way. In the process of this investigation, the children played with all sorts of mathematical ideas. The places where their expectations and the results of their experimentation did not coincide dug up their mental earth a bit, readying it for the seed of more information. I wondered if the way in which they put “starting point” for measurement in their bodies would help them understand and accept standard technique for measuring when its time comes. Their work with estimation and confirmation through trial requires mathematical reasoning. Their persistence is a habit of mind that all investigators need. And the flow between discrete number (counting 105 links) and continuous measurement (length) set a foundation for further exploration of number. Not to mention the pleasure of it all. Such a rich experience from an ordinary paper chain!